1. 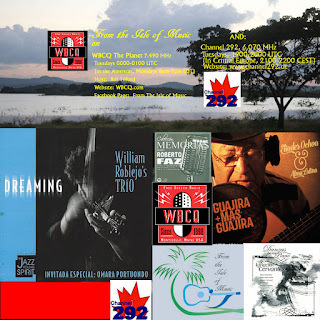 Cuban Jazz/Fusion violinist William Roblejo, whose album Dreaming was nominated for a Cubadisco award in Instrumental Music, Opera Prima (New Artist) and Best Production in 2013. 2. Legendary Cuban guitarist Eliades Ochoa, a key member of Cuarteto Patria and the Buena Vista Social Club. He is on a brand new release, Guajira Más Guajira, and we'll listen to some of that. We'll also feature some wonderful historic music by Roberto Faz and more of Danzas Para Piano de Ignacio Cervantes.